This product was designed with the same principles as the Cutter’s Mate: simplicity, comfort and ease in scoring. The big difference with the Beetle Bits is that you get the added benefit of accurate measurement in your angles and length of cuts. You are able to make the exact same measured cut over and over with ease! 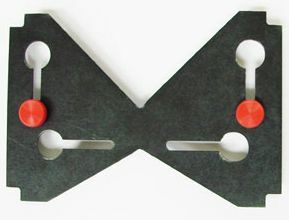 The compass dial and rests, resembling beetles, provide ease of cutting from either side of the work surface, or a straight cut perpendicular from the base ruler. This product is designed to be used with your own cutter and grids. 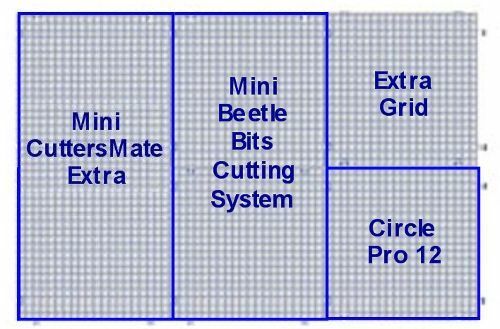 For even more simplicity, add the Flying Beetle Cutter or save money with one of our many Beetle Bits Bundles. 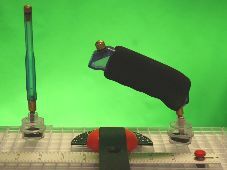 Flying Beetle Glass Cutter designed to use with this system is sold separately. The Flying Beetle Glass Cutter is designed for use with the Beetle Bit Glass Cutting System. All you need to do is press down on the button to engage the carbide cutting wheel with the glass. The Flying Beetle glides effortlessly back and forth on the straight edge bar. The bright colored pointer is in direct alignment with the lines of The Waffle Grid so you will know exactly where the score line is going to be. Save money and time by getting everything you need in one package. The Beetle Bits System saves you time and money. This money saving bundle gives you all the tools you need in one inclusive set. 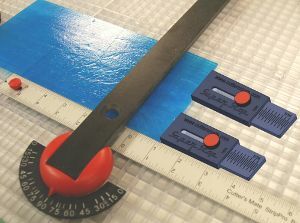 The cutting system features a simple set-up with a swiveling quick compass guide, 18" cutting bar ruler for precise cuts, 2 multi-directional glass stops for non-slip positioning, 23" straight edge and rest, 2 adjustable angle rests and an oil well. An innovative cutter that glides effortlessly on the Beetle Bits cutting bar at a 90 degree angle creating a perfect score every time. Press down on the button to engage the premium CSG-10 carbide cutting wheel with glass. 11-1/4" square interconnecting Waffle Grids are an excellent cutting surface. 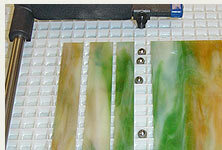 Hold tools in place and catch glass shards to keep the cutting area safe and clean. 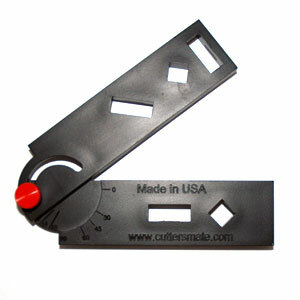 Limited time only get a Free Cutter's Caddy set to hold your tools on your waffle grids! What's in The Beetle Bits Bundle? 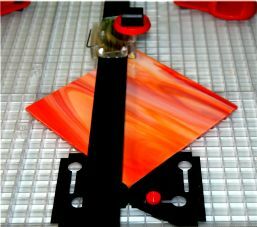 The Ultimate Fuser's Glass Cutting Station is a must for the Fuser on the go or working in a small workspace. 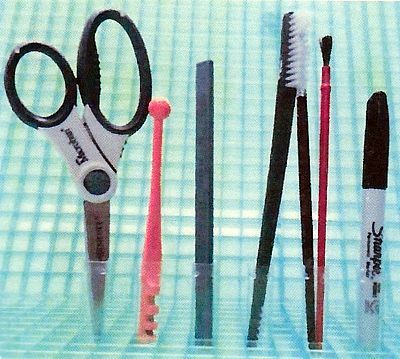 This comes with everything you need for cutting your different glass pieces to be fused. It allows you to make cuts quickly and accurate in all the different shapes, such as triangles, rectangles, diamonds and any other geometric shape. Just add your favorite cutter and you are all ready to go! Super Size your Work Surface! 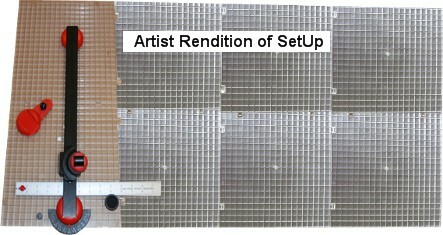 Add the 6-Pack Waffle Grid Pack (#3160C) the the system. This will provide you with now only the stripping area, but also a wonderful work surface to complete your projects. This bundle is ready to roll! It is the perfect traveling companion for the Artist on the Go. It takes up very little space so it can be set up to be a complete mobile studio or as an individual work station. Imagine being able to work in the hotel room while being away at a show just like you would at home in your studio! Total Work Area size is 22.5"x33.75"
are compatible with the Beetle Bits System also. 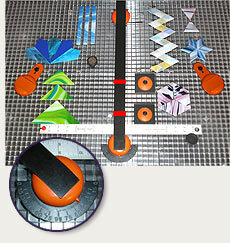 The CSG-10 Cutting Head is designed to fit all Cutter's Mate Stained Glass products. This head is precision CNC machined and then Nickel plated to increase operating life durability. The head embodies a precision ground, tungsten carbide wheel. 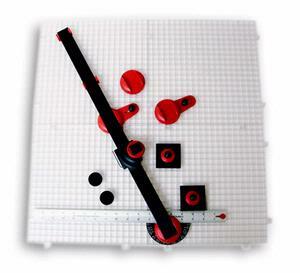 A 134 degree angle enables the user to create sharp and accurate score lines with minimal effort. The combination of an extremely hard tungsten carbide wheel, ground to a sharp cutting angle, results in the Cutter's Mate Stained Glass CSG-10 Cutting Head being a superior tool for achieving glass scoring with minimal breakage or scoring defects. 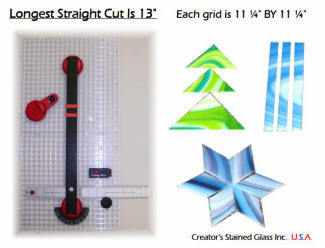 All Creator's Stained Glass Cutters come with the CSG-10 cutting head. The Angle Guide plugs directly into your Waffle Grid and stabilizes glass to produce perfect 45 and 60 degree cuts for equilateral or right triangles, or to divide a circle perfectly in half. Use the Angle Duplicator to copy any angle and align the cutting bar of your Beetle Bits System for precision pieces. Designed for right or left handed use. 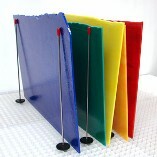 Can also be used with Strip Pro, Circle Pro 12 and the Morton Portable Glass Shop. Complete instructions included. The Super Stop make it easy to save critical size settings while working on a project. Attached to the Waffle Grid for easy use. 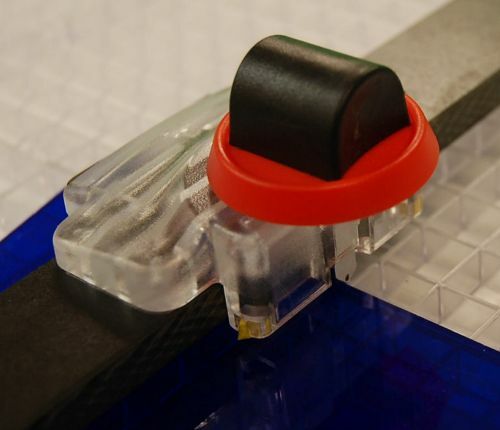 Make glass working easier with Omni-Directional Glass Stops. 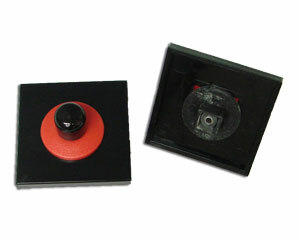 Plug in modules act as stops to keep your glass in place. 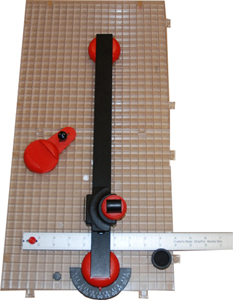 For precision alignment use with Waffle Grids (item #3161C). Pack of 2. The most versatile work surface! 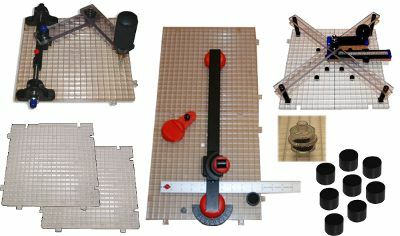 Introducing The Waffle Grid, an interconnecting grid which allows the user to configure the shape of their work table. Through its unique design, you can configure around a corner, as a connecting backsplash or even randomly turn up individual grids to have a smooth area amid a pocketed area. You can even see through it for angle patterns. Made of high impact Lexan, the surface of the 1/2-inch pockets is rounded smooth to allow your glass to glide. Want to clean out debris from a section? Just lift it out... no need to disturb your work surface! 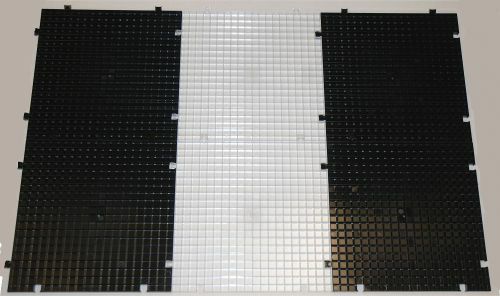 The Waffle Grid comes packaged in a 6-Pack of 11.25" x 11.25" grid sections. 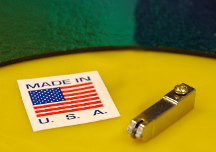 Modular design allows you to have one small surface of 11 inches by 11 inches square or a large surface of unlimited size by interconnecting many grids. Dimension does not get lost when adding grids. The tops of each of the squares are rounded smooth so glass glides easy. Allows the configuration to go around a corner such as an L-shaped counter or to design a backsplash. 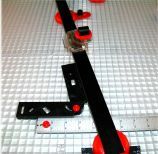 See through material allows the use of a template to be placed underneath such as a angle guide. Also excellent light transmission for a lightbox. Grids interconnect in such a way that you can flip one or more over in set-up so you could have smooth area amid pocketed areas. This would give you an area to score small pieces. When emptying out the grids, you only have to pick up one section which you can conveniently empty into a small wastebasket without disturbing the rest of your gridded work area. If you wish to store your grids, simply stack them and place in a drawer. Place them in your Waffle Grid to keep glass from slipping. Place them in your Waffle Grid for easier sliding of glass. Also, you can place speed balls in line with your score and use them to break the score! Pack of 4. Get 8 Friction Buttons, 6 Speed Balls, a Tool Caddy and an Oil Well for one low price! Keep your glass orderly with these glass rack organizers. Fits easily into the Waffle Grid to create a glass rack right where you need it the most! Comes in a pack of 8 sticks. 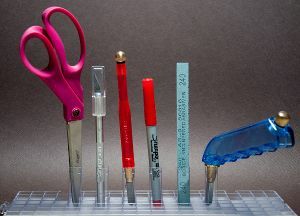 6 individual tubes that fit easily into the Waffle Grid to hold small items such as brushes, cutters, pens, markers, etc. Keeps them nearby right where you need them the most! Comes in a pack of 6 tubes made from the same material as the waffle grids. The oil well that does not spill over and will support your cutter. Your cutter will not rust or corrode while being stored in the cutting oil pod, plus it has a cap when it is not holding your cutter. You will save the cost of the oil well in spilled cutting oil!